Welcome to one of the most stereotyped states in our fair union. Is it full of Mormons like they say? No. It is certainly not full of any human beings at all. Rocks, on the other hand… if the Earth made it, it’s here. Utah is the Amazon.com of rock formations. Let’s go window shopping. What did we just say about the rocks? This is Wilson Arch. Any other state would ham it up for tourism’s sake, call it the “Gateway To Something”, and charge you $5 to walk on it. In Utah, it’s just the thing you see 20 minutes into your drive. Take it or leave it — there’s plenty more where that came from. Your camera doesn’t have enough storage space for all the natural arches this state has to offer. As a car guy, Mitch was well aware of Moab. The tourism hub is known as one of America’s prime basecamps for off-roading adventures. For a moment, we wondered: could Odie chug his way up a rockslide? He doesn’t have 4WD, or the right tires. Also he is a home on wheels. Alright, we’ll table the discussion for now. Probably for the best, as we would’ve gotten shown up by the army of Jeeps in town. Wait, this is really a ton of Jeeps. Like, too many Jeeps. Turns out, it’s Jeep Week! Moab’s version of Mardi Gras, only a lot louder and with more disposable income. We were more than happy to blend in with the droves of out-of-towners sleeping in their cars and filling up water bottles at Burger King without even so much as a glance at the cashiers. 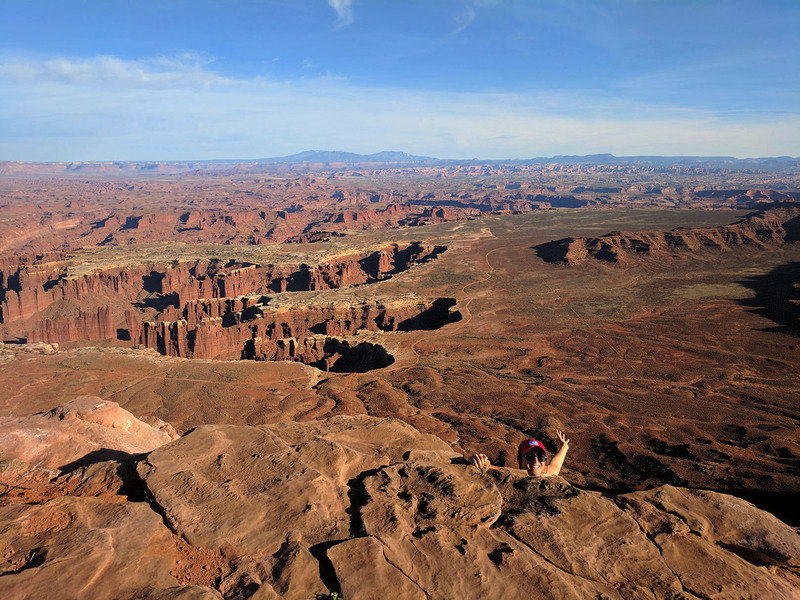 Jeep Week in Moab is more commonly known in other regions of America as “Easter.” Rogue Trip hadn’t yet experienced a true holiday away from family, so Hailey decided to win Girlfriend Of The Month by playing the role of the Easter Bunny in a 16’x6′ room. The video tells all, save for the five-minute-long jelly bean binge aftermath. 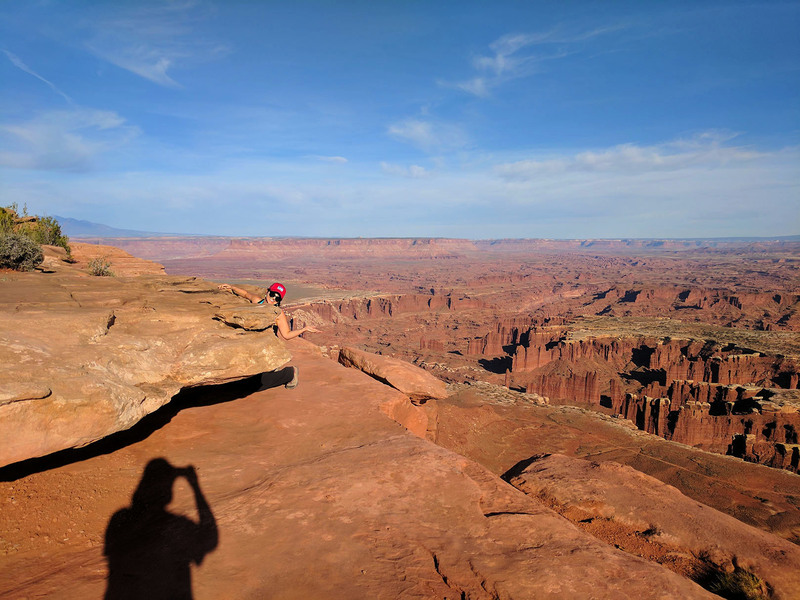 Within a stone’s throw of Moab lie two National Parks: Arches, and Canyonlands. You look at some of these rock formations and say, “ok, I’ve gotta read the scientific explanation for this.” Then you read the sign next to it with said scientific explanation, and walk away with no better grasp on reality than you had before. The stuff really does defy reason, and serves as an intimidating reminder that none of what you see here is permanent. On a long enough timeline, these monuments of nature are merely snapshots. Pretty nice backyard, Moab! But that’s not all… here is Red Cliffs Lodge, just a quick jaunt down the road in Castle Valley. Quite a few westerns of yore were filmed in this area. There are only two patches of grass in the entire state of Utah, and we plan to show you both… but that’s not why we’re here. We’re here for some horseplay. High on Hailey’s Rogue Trip to-do list, horseback riding takes her back to a handful of memorable childhood adventures. For Mitch, horseback riding takes him back to approximately this exact second. Another first for ol’ Mitchy! Is this where the key goes? Ok, no, that is definitely not where the key goes. The lovely lady in the video, who could probably snap our necks if she felt like it, is Heather — the Red Cliffs wrangler and tour guide. After hearing Mitch pronounce “water” in that signature New Yorker style, she knew to give him the most well-behaved horse of the bunch: Harley, the alpha male. Mitch later said the horse was entirely on autopilot, and the one time he gave it a spur thinking they needed to get a move on, it began urinating. Ok Harley, you clearly don’t need any tips from the humans. Just keep doing your thing while we snap some photos. Here’s yet another National Park, in a state so full of natural wonders that it’s merely the thing you drive through so you can get to other National Parks. We carved through Capitol Reef as part of Utah’s scenic Southwestern route, transitioning from the surrounding park to gorgeous Route 12. Again, what did we tell you about the rocks? Pick a rock formation! Utah has it. It was actually a gorgeous resort in little-known and lesser-populated Boulder, UT. We ate at the exquisite Hell’s Backbone Grill on the property, reminisced about life on Maui with our waiter, and then proceeded to sleep in their parking lot. Nice folks. Great steppin’ grass. Only somewhat further apart than Arches and Canyonlands are the better-known Utah national parks of Bryce Canyon and Zion. Knowing there was a heavy dose of hiking ahead of us, we chose to hit Bryce first, then grab an Airbnb, and head back towards Zion the next day, both guns blazin’. Bryce may look familiar to you, if only because it’s pretty tough to mistake for anything else. Its signature rock formations are called hoodoos — basically orphaned sections of rock wall that are now standing on their own, with mushroomy tops. They’re plentiful in other parts of Utah, but as you can see, Bryce is really hogging the hoodoos. Hailey’s in the bottom of the pic for scale. Hailey’s not in this next pic for scale, but she may as well be because you wouldn’t be able to see her. It’s got to be one of the most expansive views our eyeballs have ever processed; even as a panorama, we only got part of the scene. You play Where’s Waldo in this canyon and I promise you, Waldo will die of starvation and be consumed by vultures before you find him. The varmints in Bryce are extremely friendly, which means they’re overfed by the millions of well-meaning morons who visit the park. Here’s one of the li’l fellas posing for our camera. He then asked for $5, and when we said we didn’t realize he was working, he said “it’s cool, have a nice day” in the most sarcastic of squirrel tones. What, who carries cash anymore?! To add insult to injury, Hailey tried out the prairie dog exhibit. It was all Mitch could do not to start playing whack-a-mole. We definitely recommend staying with Celeste if you’re in the area, and testing your luck at a little donkey petting. Through the usual overzealous Google Mapping, we found yet another park near Kanab prior to hitting up Zion. This one is for all the trolls out there who think they can burst Utah’s bubble by claiming that sand is technically rock, so sand dunes are rock formations too, ergo Utah can’t possibly have every rock formation. Right? Buddy… forget it. It’s Amazon. Utah has ALL OF THE ROCKS. It’s Coral Pink Sand Dunes State Park, neatly tucked away behind a 10-mile long curvaceous side road, heavily patrolled by cows. Here’s your creepy photo of the evening. We woke up the next morning ready to tackle Zion National Park, and that exuberance bled over to this chance encounter with a television crew, who we tailed aggressively for about 4 miles before they finally pulled over. Hailey is Rogue Trip’s designated Ambassador, so she did the chatting; they were quite envious of our journey together, but alas, didn’t put us on camera, even after hearing how we got on a radio show in Colorado. You’ll rue the day you passed on this talent, Channel 2! Fists shaking out the window in rage, we made it to Zion. Bryce Canyon National Park was Hailey’s favorite part of Utah. But for Mitch, Zion is the clear winner, in part because there are few entrances in America as grand as this. First on the menu: Angel’s Landing. This is the most popular hike in the park, albeit with a major asterisk. You see this gargantuan set of uphill switchbacks? This is the easier set — it gets a lot tighter before you’ve hit the 2-mile mark, about a thousand feet up. But that’s not the asterisk. Upon reaching the top of the switchbacks, most folks stop there, admire the view, and head back down. But the real Angel’s Landing hike is another half-mile up the sheer side of a cliff, where the only help you’re given is a chain guide and a footpath 12 inches wide. Oh, and of course, people are coming back down on that same 12-inch footpath. We had arrived somewhat late to Zion and planned to sleep nearby in order to get ahead of crowds the next day. Good call on our part, as Zion was the busiest national park we’d ever seen. In April, no less! Having to ford a river was a clue that we had perhaps missed the signage, so we doubled back. Ah, here we go. These three hundred million year-old rocks are now one day older, and we were some of the only folks awake early enough to celebrate with them. The Rogue Trip itinerary required that we skip some huge chunks of Utah, such as the Salt Lake City area. Make no mistake: we’ll be back. Four thumbs up for this fine state. Now it’s on to Arizona, because we have no air conditioning, and driving through Arizona without A/C is like asking Gilbert Gottfried to give your eulogy. And we do love us some Gilbert Gottfried. Follow our blog to be notified of new posts by email.